The most exciting event in the adult entertainment industry, launched in 2010! Four cities, two continents... YNOT Grand Prix is a truly global event that delivers a one-of-a-kind experience. 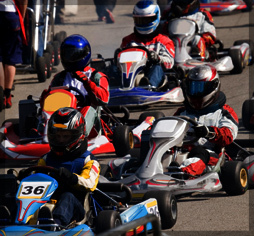 YNOT GP carefully selected the best Karting tracks in the world, working closely with the facilities managers to offer participants and sponsors an excellent opportunity to promote their businesses and realize return on investment. Fast. Fun. Entertaining. Woo potential affiliates, thank your regular customers, or challenge friends and foes with an adrenaline rush none of you will be able to forget. Competitors will be divided into groups, which will complete in a 10-minute practice session / qualifying session. Based on the best lap time results from the qualifying session, the top drivers will go through to the Final. In the final, grid positions will be determined by fastest lap times. Drivers take their positions on the starting grid according to their qualifying times. After 15 minutes or a set number of laps, the first driver across the finish line wins! This race format guarantees all drivers 10 minutes minimum in the seat (practice and qualifying) with the top drivers receiving an additional 10 - 15 minutes during the qualifying and final races. Trophies will be awarded to the top 3 finishers and points will be awarded to each participant who finishes in the final race at each track. The driver who collects the most points during the year will be crowned champion and receive $1000 cash after the Prague Race!